Working towards making sensory, and communication devices even more efficient and compact than they are today, researchers from Case Western University have now developed atomically thin drumheads. These drumheads, according to the paper written by the researchers, is ten trillion times lesser in volume, and a hundred thousand times thinner than a human eardrum. Along with that, the drum is capable of sensing sounds far beyond the capabilities of a human ear. Apparently, the synthetically made drums offer a broad dynamic range (upto ~110dB) at radio frequencies up to 120MHz. For comparison, a human eardrum offers dynamic range of upto 100dB in the range of 10Hz to 10KHz — in other words, not even close to what the synthetic drum can offer. Feng and his team made the synthetic drums out of atomic layers of semiconductor crystals. 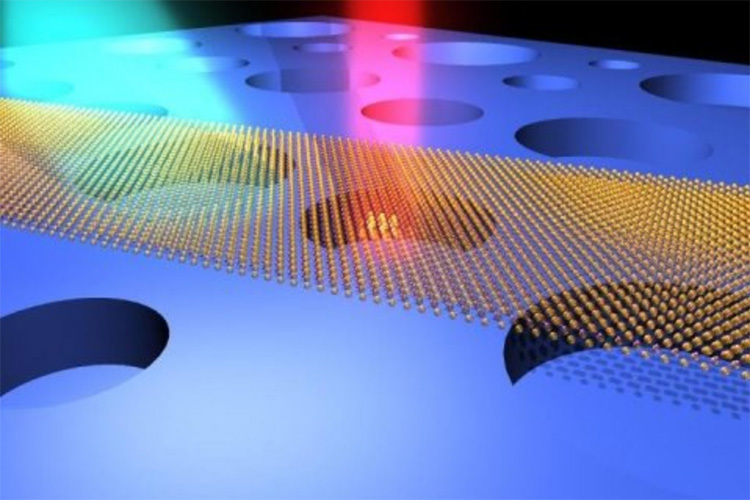 The team exfoliated atomic layers from the semiconductor crystal; and used a combination of nanofabrication and micromanipulation techniques to suspend the atomic-layers over micro-cavities pre-defined on a silicon wafer. Naturally, the team is very proud of what they’ve built. “Not only having surprisingly large dynamic range with such tiny volume and mass, they are also energy-efficient and very ‘quiet’ devices,” Feng said. They hope that these new ‘drums’ will be able to drive the next generation of communication, and sensory devices.